It’s funny how you could be at some random place and someone starts taking pictures of a child just because they are “cute”.. I find that rather odd and discomforting. My sister, who has 2 mixed full blown American blood girls, is baffled how people can just approach her daughter and stroke her blonde hair and look deep into her blue eyes. Some even approach her eldest daughter asking to take pictures with her because she’s so pretty. That’s really flattering but to many people, it’s just plain dodgy. Us Malaysians can be/are very friendly. It’s great how friendly people can be and honestly, it’s really uplifting. The only problem many people have is that we tend to get a little too friendly, like the above mentioned. For me, I usually don’t say much about it as my line of industry requires the picture taking, the hand shaking, the smiling, etc, etc. Question is, how friendly is too friendly? From a flyer I had just recently picked up at PPBM, there were some great tips and insights. Establish a close and open relationship with your child at an early age, this will make it easier for them to ask you for help and builder their self-esteem. Empower your child with honest and factual information about their body and let them know what is and isn’t appropriate touching. Teach your child what everyone’s private areas (covered by their swimsuit) are just for themselves and no one should try touch them. Most child abuse and abduction cases are by someone the child knows – teach your child to say NO if they ever feel uncomfortable around anyone. Never force a child to hug or kiss a relative if they don’t want to. it’s ok to say no if they feel uncomfortable, they don’t need to be polite. Establish a “no secrets” rule in your family, especially if something makes your child feel nervous, scared or they don’t have that “uh-oh” feeling. give your child the names (and phone numbers) of at least 3 trusted adults ho they can always confide in, especially if you’re not available. Teach your children to never go anywhere with an adult they don’t know, and if they become lost, go to a mother with children or to STOP and yell for help. Never leave your child with a person you don’t trust. Create a secret password between you and your children. if ever a stranger approaches your child, have your child ask the stranger for the password. Educating your child to be wary of strangers at a very young age is always best. Personally, I try to remind my daughter on the do’s and don’ts before we get out of the car to carry on our day. Another thing I try to do is teach her how to protect herself if ever, God forbid, anything happened to her and that’s to kick punch and hit the person in between the legs, bite as hard as she can and even poke the persons eyes, not to forget, scream! I also remind her never to approach people who give sweets or who are walking their pets. Kids love to play with paint, make a mess and they also love to draw on the walls… How about mashing all that together and keep the mess aside! HOW? By keeping all in a bag! Can’t remember where i saw this idea but its pretty simple and would have your littles entertained for a bit and you only need 3 things!! It’s pretty fool-proof to do this project. Your littles could help you out too! First you get your paints. I find these paints pretty good they are also pretty cheap. Got these ones for RM3.70 a bottle. We use them for painting with both brushes and finger painting. Washes off pretty easy too. Dunno about on walls, carpets and couches though… eeeeekkk..
Next, you get your Ziploc bag ready. Fill in about 2 table spoons of paint into each bag. Let out almost all the air out of the bag and zip it up. Finally, get your masking tape and tape each paint filled bag onto a window or sliding window. And viola! It’s done! This may seem a bit messy but it was a spur of the moment kinda thing but I hope, if you give it a try, your littles will enjoy it. Mine certainly do. Naturally, as a parent, you’d get pretty upset when you catch you’re preschooler telling a lie. You wonder what you had done wrong as a parent for this to even happen. Don’t be too hard on yourself and especially to your preschooler about this. Lying and untruthfulness is developmentally normal for a preschooler. And that means that every parent goes through it. When children break something, spill drinks and even hurt people accidentally, it is only natural for them to deny the fact they had actually did it because in actual fact, they never really wanted for it to happen in the first place and also, they don’t want to get in trouble for it. Best way to deal with these incidents is to disregard the fact that they had told the lie and focus on how to fix the problem. For instance, if your child spills her drink and denies it, don’t go crazy over her lying about, just grab a cloth and ask her (nicely) to help you clean it up. However, if your child does mess up and actually admits it, be sure to praise him for his honesty. If this is practiced, it will encourage him to always tell the truth as he grows older. Bare in mind, there is a difference between lying and making up imaginary stories. She might tell you that she was outside and she had found some dinosaur eggs and the little baby dinosaurs are inside and they can’t find their mummy and the eggs need to be put in a nest to keep warm so that they can hatch. Unless it is wrong and hurtful towards others, stories like these are practically innocent. In fact, stories like these are great for your childs’ mental development. To encourage your child even more, try asking her for more details of the story, maybe she found some rocks she is pretending to be the “eggs”, try have her draw what the baby dinosaur may look like, what their mummy looks like, where do they live? Activities like these help with expanding their imagination and also helps with their critical thinking. To avoid and discourage less fibbing in the future, talk with your child and explain why lying is wrong and how it effects other people. Of course you’ll be doing all the talking while she looks around the room, playing with her fingers or hair. But it’s always good to make it a habit to discuss these issues with your children no matter how old they are. Developing a relationship of trust and knowing that, in the future, you child will talk to you about pretty much anything. School is back in and it’s time for us parents to be a bit cautious on common epidemics that occur in schools mainly for the younger children. 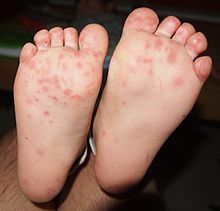 Hand, foot and mouth disease (HFMD) a common, highly contagious viral illness. This disease is typically named after the breakout of sores and rashes which occur on the hands, feet and in the mouth. HFMD often occurs in children under 10 yeaThe virus can be transmitted from person to person via direct contact with nose and throat discharges, saliva, fluid from blisters, or the stool of infected persons. The virus may continue to be excreted in the stools of infected persons up till 1 month. Signs and symptoms of HFMD normally appear 3-6 days after exposure to the virus. A person is most contagious during the first week of the illness. Common symptoms include fever, tiredness, loss of appetite, sores/ulcers in the mouth, rashes with blisters and general discomfort and irritability. The rashes caused by HFMD are rarely itchy for children however, if adults are infected, it can cause serious itchiness. Blisters on the other hand can be extremely painful. A baby with HFMD may not want to breastfeed or eat because of the sores in her mouth. Although you may just have to wait out the seven to 14 days it typically takes for the HFMD to subside as no antiviral treatment or vaccine is currently available for HFMD, you can make your baby more comfortable. Dehydration very important apart from body temperature monitoring because the mouth sores may make it difficult and painful for children to eat and drink. Give your child paracetamol suspension, under your doctor’s recommendation. Expose your child under the fan. Teething gel may relieve your baby’s pain. Keep offering breastmilk or formula, or water and diluted juice for an older baby. A toddler may enjoy an ice-lolly, which will provide fluids and soothe the sores. Bring your child to the nearest clinic if they show signs and symptoms. Refrain from sending them to child care centers, kindergartens or schools. Avoid close contact (kissing, hugging, sharing utensils, etc.) with children who are infected with HFMD to reduce of the risk of infection. Spotting a tiny little white thing on your child’s hair is enough to make a parent freak out. There is no need to panic. Head lice may be icky but they don’t usually cause any serious diseases. Head lice are tiny six-legged insects that cling onto the scalp and neck and feed on human blood. A louse is basically the size of a sesame seed and could be difficult to spot although you can still spot them with the naked eye. Lice eggs (nits), however are glued onto the hairs close to the scalp and are slightly harder to see. Head lice are most common in young children who go to day care, preschool, or elementary school. Children this age often play very closely together, have more hair-to-hair contact, and they may also share brushes, hats, hair clips, and other things kids normally do. Adults who live with children also have a risk of getting head lice. Lice usually spreads via direct head-to-head contact that allows the pests to crawl from one person’s hair into another. Lice can also survive for a short period on clothing or other personal items, so a shared hairbrush can help a louse find a new home (head) in no time. Lice cannot jump or fly from one person to another. Head lice can be white, brown, or dark gray. They are most often found in the hair at the back of the neck or behind the ears. The nits are oval dandruff like specks which are tightly glued to hairs near the scalp. If you try to slide the nits off with your fingers, they won’t budge. Spotting a live louse or nymph (a young louse) is often the only sign of an infestation. Seeing nits alone can’t confirm an infestation. In many children, head lice don’t cause any discomfort. When symptoms do happen, the most common problem is itching and that could start only weeks or even months after the lice actually move in. The itching from lice is caused by an allergic reaction to the bug bites. A lot of scratching may lead to sores or raw skin on the scalp. It’s not common, but sores from scratching could actually become infected. Call a doctor as soon as the skin becomes red, swollen, or painful; or the lymph nodes in the neck become tender. These may be signs of a skin infection. Head lice will not go away on their own. If you suspect your child has an infestation, there are several steps you should take right away. Call your doctor to confirm the diagnosis. Notify your child’s day care or school so other students can be checked. Examine all other members of the household for signs of lice. Finally, treat everyone who’s infected at the same time to prevent it from reoccurring in the near future. You can find lice-killing treatments over the counter which are made from extracts of chrysanthemums or a synthetic version that is similar. They are considered safe, but they may not be recommended for young children. These products kill live lice but not nits. Follow instructions on the label carefully for how long the medication should be left on the hair and how it should be washed off. A second treatment may be needed 9 to 10 days later. If two treatments don’t do the job, see your doctor for stronger medication. Although lice don’t survive long on bedding, it’s best to wash the sheets of anyone being treated for lice. Clothing worn in the past 48 hours should also be washed in hot water. While parents are sometimes told to clean and quarantine all of a child’s stuffed animals, experts say this is not necessary. If your child sleeps with a favorite plush toy, put it in a hot dryer for 20 minutes. That should kill any creepy-crawlies. Unlike fleas and ticks, which can live off the host, head lice must live on its host to survive. Therefore there is very little benefit in spraying buildings or subjecting children’s environments to the other remedial treatments. Parents want to take immediate action for the lice problems their children bring home. Unfortunately, many often think their homes to have lice rather than the children. The truth of the matter is that the majority of head lice transmissions occur through person-to-person contact. Spraying the environment or hiring extermination services for head lice eradication is unwarranted, and can also pose potential health threats. The famous kutu-comb! Fine-toothed combs are another way to get rid of lice. This comb has teeth fine enough to pull out lice and their nits. It worked for the ancient Egyptians — nit combs have been found in their tombs. The drawback is that it takes a very long time and patience (for both the comber and the child) to comb every last nit out of a child’s hair. It may be more effective to comb the hair after treating with a medicated shampoo to get rid of any stragglers. If your child is 2 years old or younger, you should not use medicated lice treatments. You’ll need to remove the nits and lice by hand. Head lice are not a scourge of the lower classes, nor a sign of poor hygiene. They affect children across all levels of income, social class, and cleanliness. The bugs can survive underwater for up to 6 hours, so kids who bathe regularly are just as vulnerable. The good news is lice don’t carry diseases. If your child is infested with lice, it is best to inform your child’s school immediately so parents can check their children and take appropriate measures. After treatment, dead eggs may remain in a child’s hair until they are removed. Some schools have a “no nits” policy, meaning the eggs must be removed before the child returns to class. School administrators should not consider spraying lockers or coat racks, but rather should adopt a sanitary strategy for the short term storage of hats and coats. In the home, parents should be more focused on thorough nits removal than with unnecessary housework or bagging. Vacuuming is the safest and best way to remove lice or fallen hairs with attached nits from upholstered furniture, rugs, stuffed animals and cars. Placing items like bed sheets in a dryer for ½ hour on high heat is just as effective as washing them. Additionally, parents need only be concerned about items and surfaces that have had recent contact with affected individuals. If you have young children, there’s unfortunately very little you can do to ward off head lice. Children will be children, and when they put their heads together or share hair bows, lice get a free ticket to ride. Your best defense is to examine your child’s hair and scalp regularly so you can catch an infestation early. Quick treatment will help prevent the bugs from spreading to the rest of the family. No matter how long the problem lasts, be sure to remind your child that although having lice can certainly be very embarrassing, anyone can get them. It’s important for kids to understand that they haven’t done anything wrong and that having lice doesn’t make them dirty. And reassure them that as frustrating as getting rid of the lice can be, there is light at the end of the tunnel. Is Early Childhood Education Important? The rat race isn’t just in the corporate world. Competition starts for children since the day they were born, well, these days anyway. Nowadays it’s all about how many teeth does your baby have? Can your baby walk yet? What words can your baby say already? Can your toddler read yet? What other languages can your child speak? Is your toddler potty trained yet? The list goes on! Just when you though high-school was finally over, peer pressure is never-ending! Welcome to motherhood! Its a whole other level of peer pressure and it can be very stressful to a parent. But all of this can be conquered if you just let go. Of course we want our children to be successful, for their potential to shine and to change the world, who wouldn’t want that for their child? But when it comes to early childhood education, does that education really need to be about reading, writing and doing math? Not every 3 year old can read a Peter and Jane book and not all 2 year olds can sing the alphabet. Not all babies can walk at the age of 11 months and not all can roll over by the time they turn 4 months. ALL CHILDREN ARE DIFFERENT and people have got to start realising that! Early childhood education is a big thing these days. Parents are sending their children to pre-schools and kindergartens at the age of 3. Yes, it is possible to teach a 3 year old to read but what is the rush? In many European countries, children don’t even start learning to read until they turn 5, yes, FIVE! Children generally start school at the age of 6 or 7 and then it’s full speed ahead from there. There is primary school then secondary school then college then university then work; work, work, work, work, work! All this doesn’t mean you need to throw away your career just so you can stay at home and do all this yourself to avoid sending your children to nursery or play school, no. A working parent should not have to feel guilty that they have to send their children to school so that they can earn a living in order to put their children in good schools and live a stable life. That’s not the point. Point is, learning starts at home. Yes, all we want is for our children to grow up and be the best but what we really need is to let our children be their best at their own pace. Being a child shouldn’t be so stressful, besides, you’re only a child once and then you have to put yourself in that big dark box we call society and where playing about is considered ‘childish‘. Things like saying please, thank you, excuse me, treating others with respect, eating with your mouth closed, not interrupting a conversation, picking up litter, not littering, consideration for others, table manners…. There are soooooo many things a child will not learn in school and that is etiquette. It’s like what they say in Malay, “adab itu lebih tinggi daripada ilmu” which means etiquette is far greater than knowledge. One can have all the knowledge of the world but without ethics, that knowledge is useless.